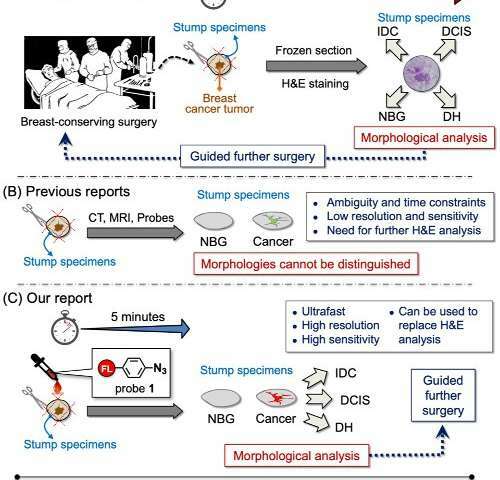 Scientists from the RIKEN Cluster for Pioneering Research (CPR), Osaka University, and collaborators have developed a new rapid and inexpensive way to accurately detect the margins between cancer and non-cancerous tissue during breast surgery. Their system is noteworthy in that it can detect the morphology of the cells, differentiating between cells that are more or less dangerous. Today, breast-conserving surgery is widely used for the treatment of breast cancer. As a result, finding exactly where a tumor ends and where the healthy tissue begins is an important—but difficult—task for cancer surgeons. Patients hope to keep as much of their healthy breast as possible, but not removing enough can lead to recurrences. At present, the most popular method for finding boundaries is frozen section analysis but it is time-consuming and labor-intensive. For the frozen section analysis, tissues have to be taken and examined during the surgery by a pathologist in a process that can take as long as a half hour. 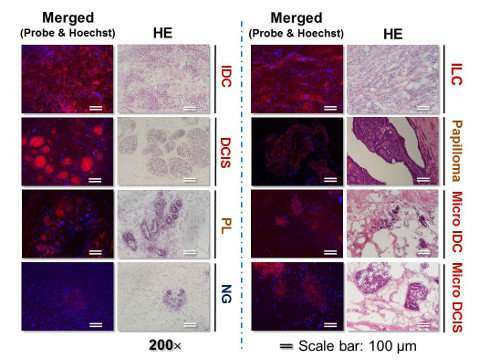 Now, however, in a study published in Advanced Science, scientists have developed a way to sensitively, selectively, and quickly detect surgical margins by using a "click-to-sense" acrolein probe that conjugates with the components of live breast cancer cells. Using resected stumps from patients during surgery, they found that the method is both sensitive, in that in is almost equal to pathology in identifying tumor tissue, and selective, in that it does not often identify non-tumor tissue inaccurately as tumors. The secret to the method is acrolein, a highly toxic chemical that is generated in tumor cells and other cells undergoing oxidative stress. Previously, the group had developed an azide probe that "clicks" to acrolein and then can be made to glow, giving visual clues on the concentration of acrolein in cells. Using this method, they analyzed tissues in real-time from a group of patients who had given consent to participating in the study. They took 30 stumps of cancerous tissue and 30 of normal tissue resected from patients during surgery, and examined them using the fluorescence-based acrolein probe. Using the optimal amount of the probe, they found that both the sensitivity and selectivity were 97 percent. According to Shinzaburo Noguchi of Osaka University, whose team performed the surgeries, "We were quite surprised that the probe developed by RIKEN could so accurately and rapidly identify tissues. This method seems to have the potential to be a great advance for breast-conserving breast cancer surgery." Looking to the future, Katsunori Tanaka of RIKEN, whose team developed the probe, says, "We are also excited that our system has been able to identify other types of cancer cells as well. In the current study we focused on breast cancer, which has a high prevalence, and we are planning to move it into clinical trials now and to launch studies with other types of cancer as well."